37116 passes Wolvercote on 18 March 2018 with the 3Z01 09:52 Tonbridge to Derby RTC Network Rail test train. 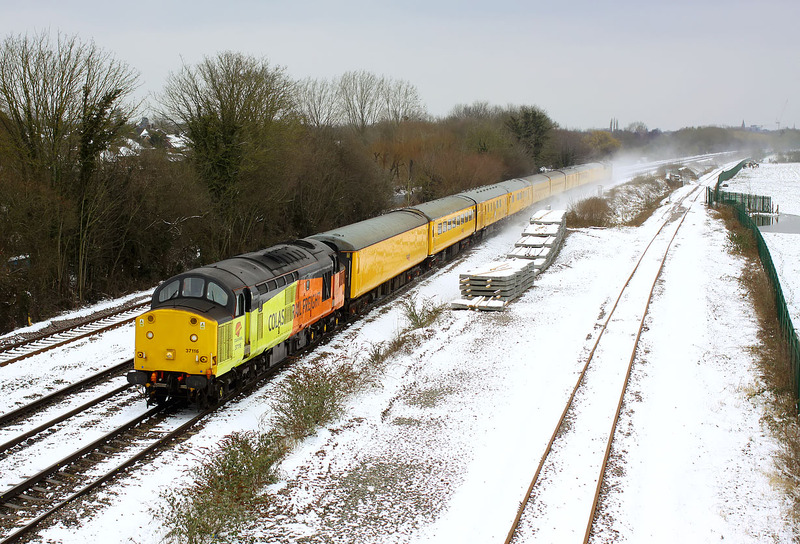 Not the Class 73 hauled train implied by Realtime Trains, but the nine coach train certainly makes an impressive sight in the snow, despite the lack of any sunshine. 37254 Cardiff Canton on the rear is almost hidden by the spray of snow being kicked up by the train. Many thanks to Peter Tandy for pointing out that this was running, as being a Sunday morning, I might not have checked for any special workings.